Featured on the December 12, 2009 episode. Reprinted from Rose’s Heavenly Cakes by Rose Levy Berenbaum. Copyright © 2009. Published by Wiley. So that people who avoid alcohol could still enjoy the extraordinarily moist yet soft texture of my Grand Marnier cake, I’ve adapted the recipe using ground almonds and lemon. The almonds are responsible for the wondrously moist and dense crumb. The divinely luscious fl avor of lemon is punched up with zesty lemon oil. Creating this cake presented a challenge. 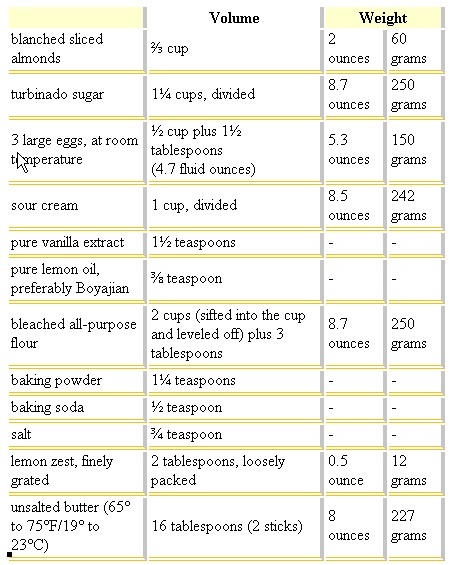 It required less leavening because more sugar was necessary to balance the lemon juice. I couldn’t add the extra sugar to the syrup because it wouldn’t dissolve, so it had to be added to the cake, which made the cake more tender. All-purpose flour with its higher protein compensated perfectly for the increased tenderness. I love this cake so much that I’m offering it in two sizes, first in a full-size 10-cup fluted tube pan, and also as a variation at two-thirds the size, in a 6-cup fluted tube pan, which is perfect for holiday giving. You can serve this cake the day it is made, but the lemon flavor mellows and becomes more pure, and the syrup distributes more evenly, by the next day. PLAN AHEAD For best flavor, complete the cake 1 day ahead. PREHEAT THE OVEN Twenty minutes or more before baking, set an oven rack in the lower third of the oven and preheat the oven to 350°F/175°C (325°F/160°C if using a dark pan). TOAST AND GRIND THE ALMONDS Spread the almonds evenly on a baking sheet and bake for about 7 minutes, or until pale gold. Stir once or twice to ensure even toasting and avoid overbrowning. Cool completely. In a food processor, process until fairly fine. Add ¼ cup of the sugar and process until very fine. MIX THE LIQUID INGREDIENTS In a medium bowl, whisk the eggs, ¼ cup of the sour cream, the vanilla, and lemon oil just until lightly combined. MAKE THE BATTER In the bowl of a stand mixer fitted with the flat beater, mix the ground almonds, the remaining sugar, the flour, baking powder, baking soda, salt, and lemon zest on low speed for about 30 seconds. Add the butter and the remaining sour cream. Mix on low speed until the dry ingredients are moistened. Raise the speed to medium and beat for 1½ minutes. Scrape down the sides of the bowl. BAKE THE CAKE Bake for 45 to 55 minutes, or until a wooden toothpick inserted between the tube and the side comes out clean and the cake springs back when pressed lightly in the center. An instant-read thermometer inserted near the center should read 200° to 205°F/93° to 96°C. Make the syrup shortly before the cake is finished baking. MAKE THE LEMON SYRUP In a 1-cup or larger microwavable glass measure (or a small saucepan over medium heat), heat the sugar and lemon juice, stirring often until the sugar is almost completely dissolved. Do not boil. A few undissolved grains form a sparkly, crackly finish to the crust. Cover it tightly to prevent evaporation. APPLY THE SYRUP AND COOL AND UNMOLD THE CAKE As soon as the cake comes out of the oven, place the pan on a wire rack, poke the cake all over with a thin skewer, and brush it with about one-third of the syrup. Let the cake cool in the pan for 10 minutes. 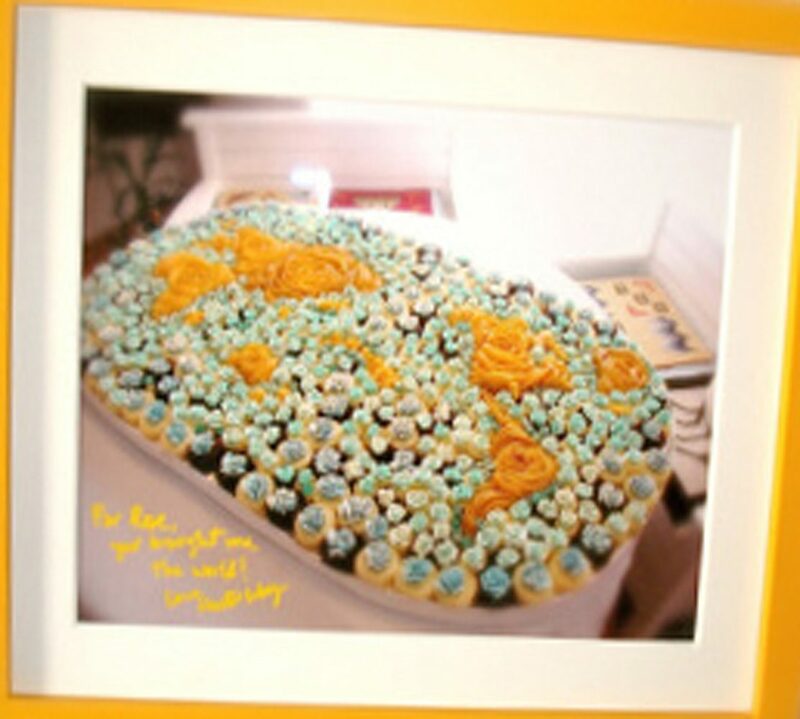 Invert it onto a 10-inch cardboard round or serving plate. Brush the top and sides of the cake with the remaining syrup. Cool completely and wrap airtight. Golden Gift Lemon Almond Cake If you don’t have a 6-cup fluted tube pan, the recipe also makes a lovely presentation if baked in an 8½ by 4½-inch loaf pan (6 cups). It’s also fine to use a disposable aluminum foil pan. Make two-thirds of the batter, but use ¾ teaspoon baking powder and ½ teaspoon of baking soda. Bake for 40 to 50 minutes. Make two-thirds of the syrup. When cool, wrap the cake in holiday-tinted plastic wrap and tie the package with a bow. This cake serves 8 to 10.